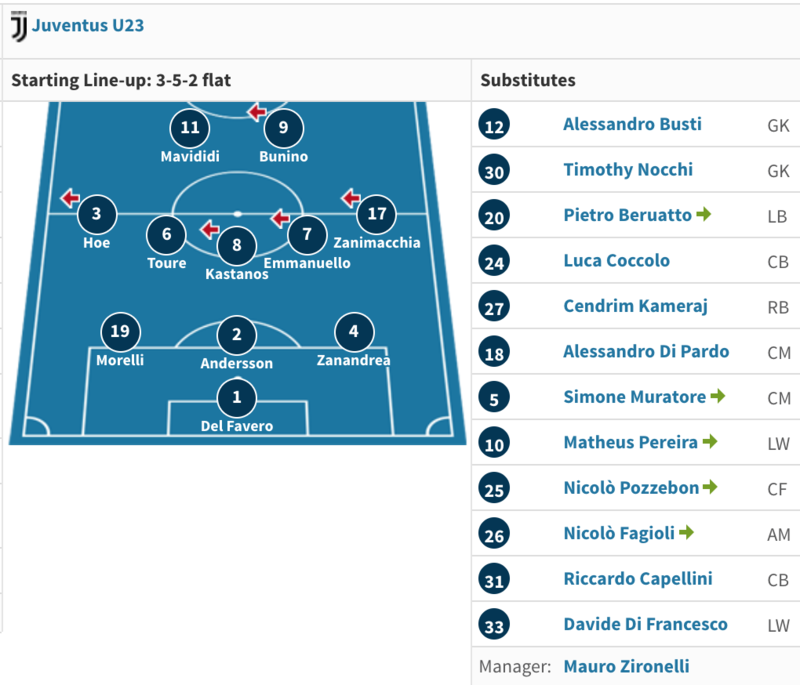 After much debate, much pushing, legal challenges, threats of boycott and still no set fixtures in place or even an official squad list, finally we are on the verge of the launch of the Juve U23 side. 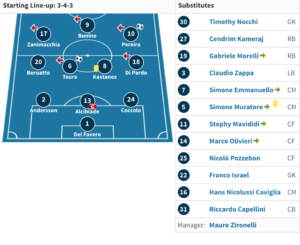 Who kick off their campaign this Tuesday in the coppa italia at home to Cuneo. Whilst there are many, myself included, who let excitement take hold all too easily. Dreaming of a squad boasting the cream of the crop of our budding youngsters. The reality is proving somewhat different, altogether more reasonable. For why would we place any promising youngster already proven at Serie B level or even higher, into the third tier of Italian football? I suspect the make-up of the squad will change when/if we gain promotion to Serie B, but for now the task is to launch the damn thing and aim to consolidate and create a platform for promotion. Which will certainly not be as simple as could at a glance be assumed. Whilst there were many rumblings of other top serie A sides entering a team, it was only Juve who made the final cut. The B Teams must have 23 players, 19 of which were born after January 1 1996. 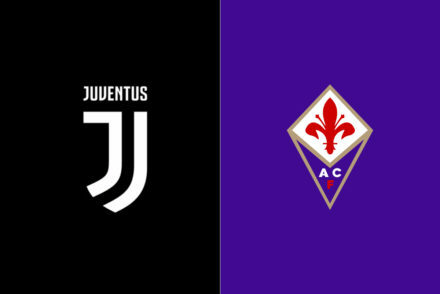 At least 16 of the players must be registered with a club affiliated with the FIGC for at least seven sporting seasons, which means limiting the number of imports. Players can move between parent and B Team clubs, but if they have at least five appearances for the first team, they won’t be allowed back into the B Team. 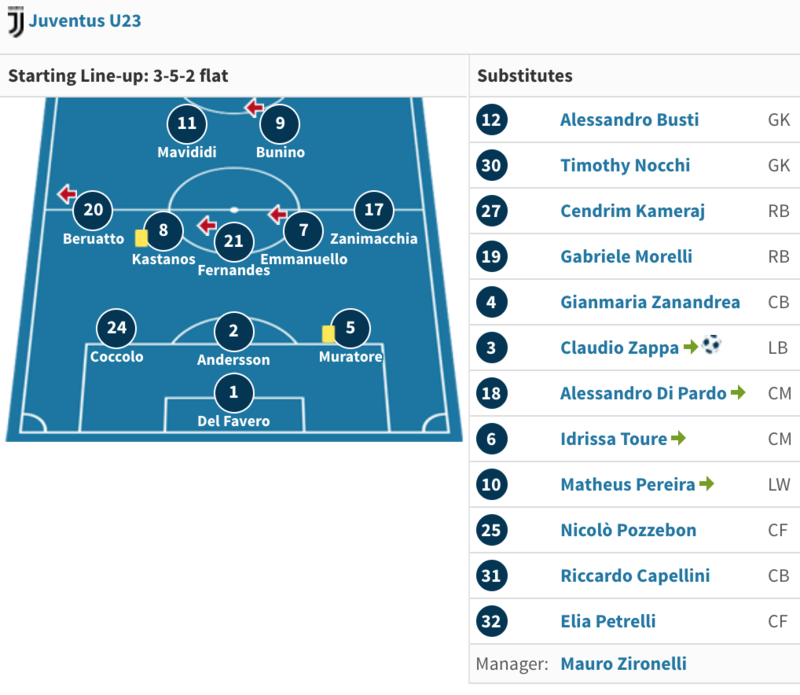 And so who is to lead these fledgling juventini on their maiden voyage? 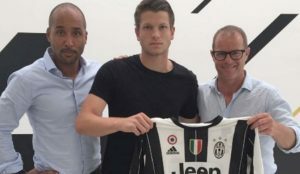 The manager of Juventus Under 23 will be Mauro Zironelli, who previously enjoyed a long career as a player representing the likes of Vicenza, Fiorentina, Pescara, and Chievo Verona. He started his coaching adventure at Venezia in 2006 for whom he also played, managing the youth team. Zironelli has coached in Italian non-league and in Serie D, with his last role seeing him achieve promotion to Serie C with Mestre in the 17/18 season. 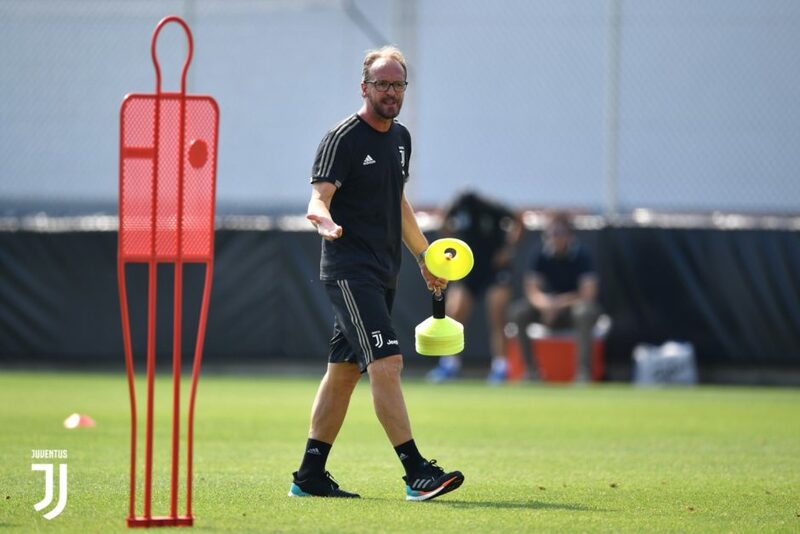 Also on the Juventus Under 23 bench will be Stefano Sottoriva (assistant manager), Daniele Palazzolo (athletic trainer), Samuele Callegaro (assistant athletic trainer) and Cristiano Lupatelli (goalkeeping coach). Highly thought of and expected to develop into a top flight talent. Has played for Italy U16, U18, U19, U20. Was number one for our primavera last term. Long term loan GK who has a wealth of experience, 117 games in the second and third tier. Uruguay U20 keeper, signed for 1.6m from Nacional recently. Canadian born shot-stopper who has been involved with the Canada U23 side, but yet to make his debut. Joined our youth set a few years back. 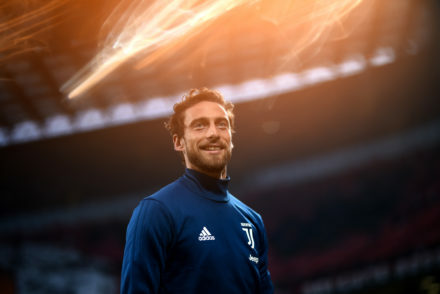 Having spent most of his earlier career in the juve ranks as a lad then loan traveler, Raffaele comes back to the club with 200 appearances for youth, Serie B and C sides. He will add some much needed experience to the back line and is a former Italy U20. Mattias has represented Sweden in the youth set-up from U17-U19 and spent last season out on loan at Den Bosch, (Netherlands 2nd division) where he managed just 10 outings. 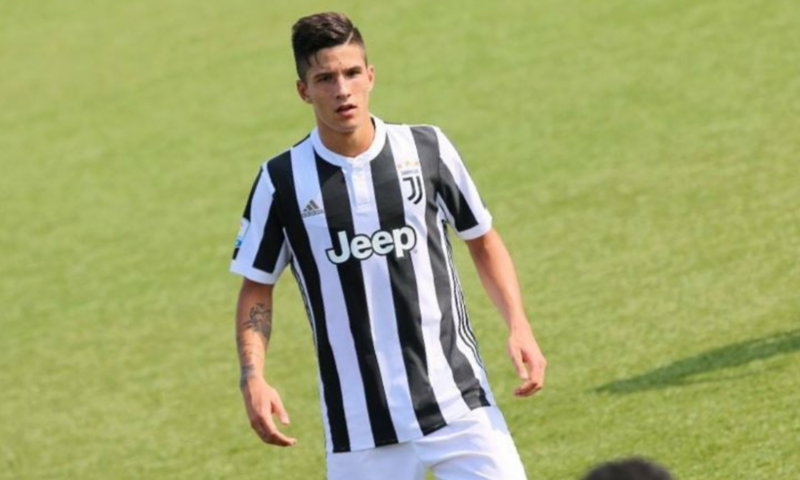 Luca Coccolo, has represented Italy at U17-U19 level, with 11 senior appearances to his name at club level in Serie C. Has been with the club since childhood. Italian U20 starlet who operates at LB or LM. Promoted from the youth side. Zappa is a long standing juve youth product. Has played close to 30 games in Serie C and represented Italy at both U16 and U17 level. Livorne youngster signed on loan after a solid 41 game senior debut campaign in Serie C last season. Signed from Pescara in 2017 and featured regularly last term for our primavera squad. Switzerland U19 fullback who came to the club on a free in 2017 from Lucern. Of Kosovan heritage…Evidently. Former Italy U16 fullback. Has some experience in Serie D.
Jolly looking fellow who seems on the same stuff as Ghidoni (above). Spent last season out on loan making his senior debut for Pordernone in Serie D where he played 34 times, picking up two goals. Regular for the Italy U19s, as he has been throughout the national ranks from U15 upwards. Has been with the club since 2013. And was out on loan in Genoa’s U19s last campaign. The dynamic Dutch midfielder signed in January from the PSV youth team. Represents his country at U18 level and has also appeared in the famous orange jersey at U15,U16 and U17 level. Formerly a Juve youth player before been sold to Atalanta for a tidy 1.5m in 2014. Simone has 83 appearances at Serie B level and will likely be the leader in the middle of the park. Former Brazil U17 playmaker who came with the hopes which spring eternal when the words Brazilian and Playmaker are found together. It hasn’t yet worked out so well for Matheus who bounced around between Italy, Brazil and France before returning to the club in the Summer. What I have seen of him recently did however, look still promising. Already broken into the senior game in his native Germany, the Guinea/German midfielder was signed outright recently from Werder Bremen in Germany. Has also represented Germany at U19 level. Simone has been earmarked for a bright future for some time. Experience with the Italy U16-U19. He has been with the club since 2013. Former Italy U19 international, Luca comes on loan from Genoa. Full Cypriot international Kastanos has long demonstrated his silky skillset in the middle for the primavera and I assumed he would be off on loan, but am glad to see him the B team. He shows echoes of Dembele, the beastly Spurs midfield all rounder. Czech U21 midfielder Macek returns to the club after a successful loan in Serie B last term with Cremonese, where he made 25 appearances. Has played for Italy at U15, U16 and U18 level. 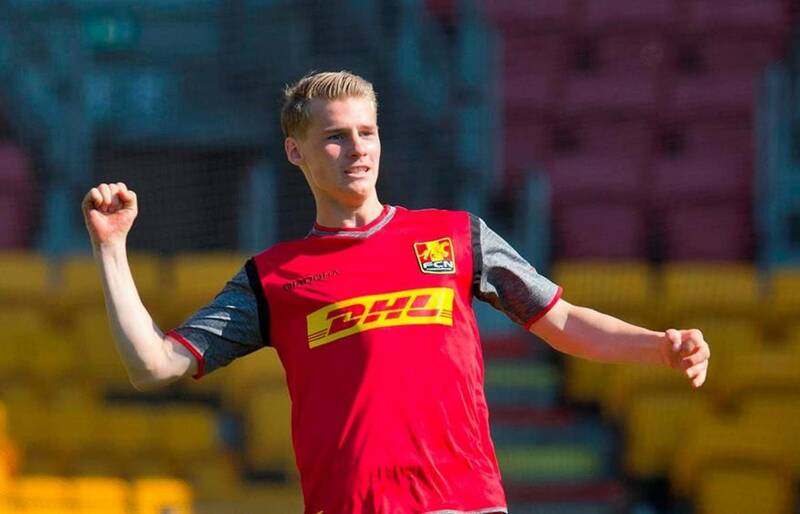 Has a season under his belt at senior level in Serie C.
Danish U18 international Nikolai was a last minute signing from Nordsjælland. He made his senior debut last season. Towering prima punta. 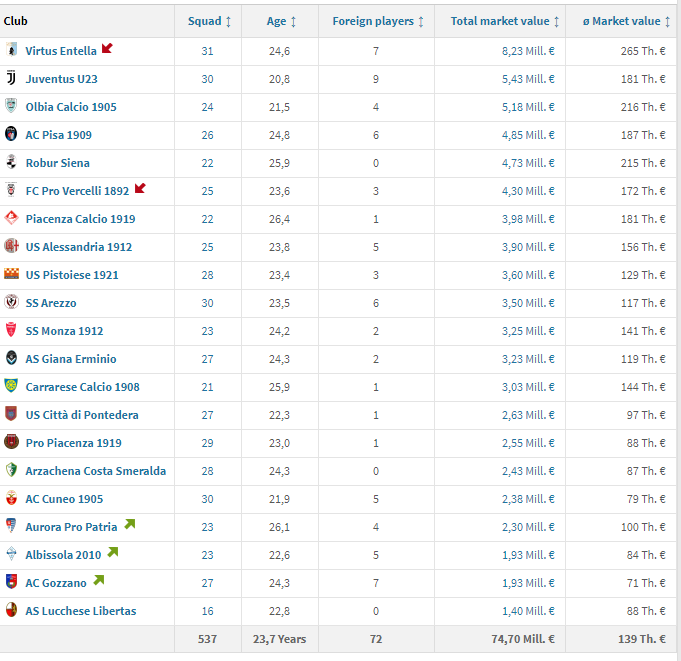 Has been part of the youth set-up for many moons until moving to Pescara for 1.6m in 2017. He comes in on loan and brings a wealth of experience in Serie B and C. Hardly prolific, but he knows his way around the third division and will certainly provide a physical presence up top. One of those men who looks like his name. Bunino, to me, suggests something big and round. A very interesting acquisition from Arsenal, who is a current England U20 international and well thought of in the game. One we are clearly expecting to progress, given the 2m fee. 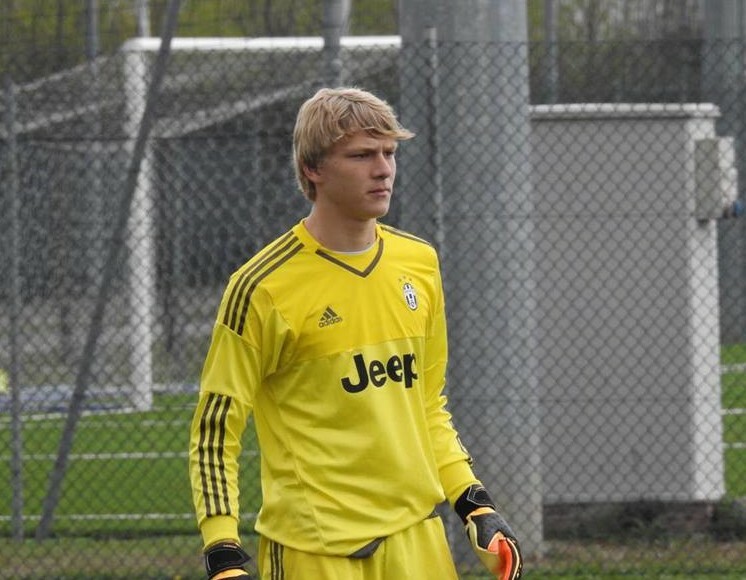 Marco appeared in the primavera ranks last Summer, on loan from Empoli, and ended up top scorer with 14 from 29. He has returned to the side on loan for another year. And looks closer to 30 than 19. Yet to make his senior debut in Italian football, the Serb giant appears determined and physically robust. Luka comes on loan from Crotone. Option to buy. Wayfaring prima punta who was on loan at Mestre the last side managed by the new boss, last term. Former Italy U16 prima punta. 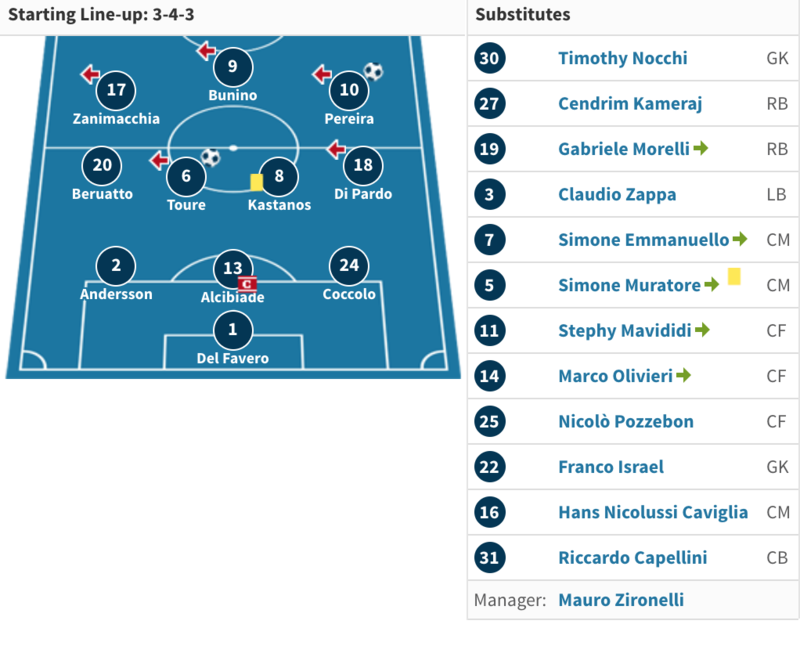 Had a senior campaign in Serie D last term with Virtus Verona. The squad above is based on my research and the first call-up and I will finish the job when the official announcement comes from the club. 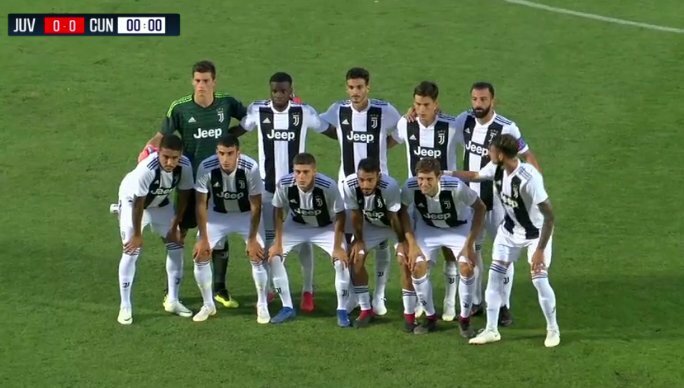 For now, we can fathom a fair idea of a squad comprising of seasoned (at this level and above) players, with varied connections to Juve alongside some longstanding youth prospects of serious potential. Mavididi, Macek, Kastanos, Toure, Pereira, Del Favero, Muratore, Fernandes and Coccolo are all expected to progress to a higher level. 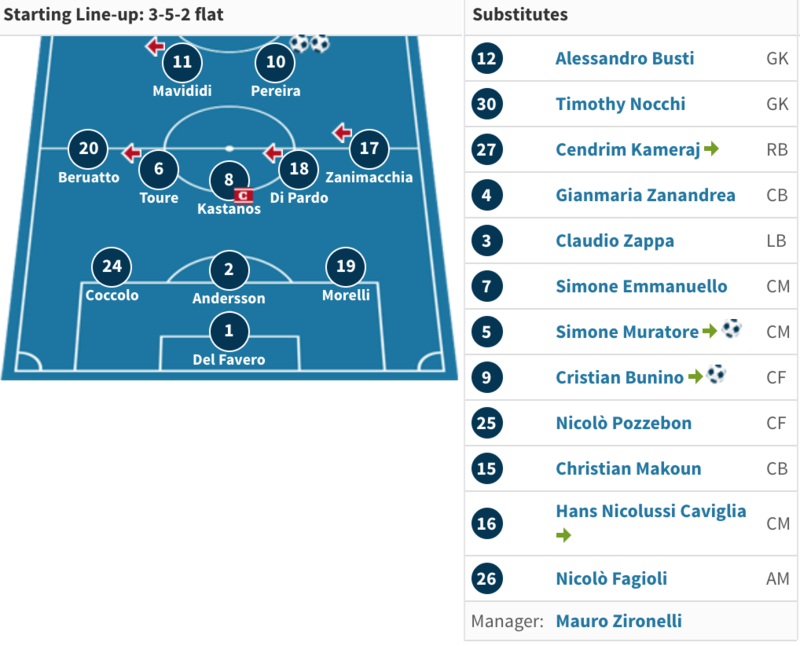 The experience of Alcibiade, Nocchi, Emmanuello and probably Bunino could form a loose backbone of the side. It makes sense to begin with those on the field who are experienced at this level or above, combined with our most promising youngsters making the step up from youth level. I shall endeavour to provide a report of the early fixtures and continue if interest in the pieces blossoms. 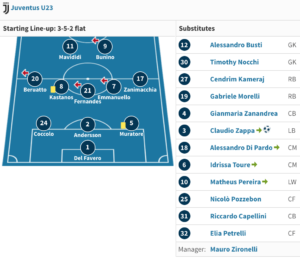 Juve B team victorious in their debut competitive fixture beating fellow Serie C side Cunceo 1-0…in the Coppa Italia. 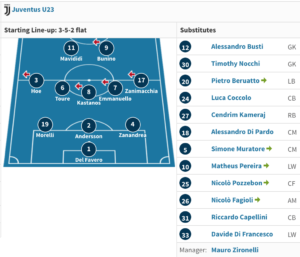 JUVENTUS U23 (3-4-2-1): Del Favero; Parodi, Alcibiades, Morelli; Di Pardo, Muratore, Kastanos, Zappa (21 ‘st Olivieri); Zanimacchia (21 ‘st Andersson), Pereira (21’ St Fagioli); Mavididi (21 ‘st Bunino). Available : Nocchi, Busti, Delli Carri, Coccolo, Toure, Fernandes, Pozzebon. Scorers : 21 ‘pt Mavididi (J), 17’ st Cais (A), 19 ‘st Balestrero (A), 23’ st Olivieri (J). Unfortunately this puts us out of the cup, but with our heads held fairly high. 17 year old Fagioli (who some might have seen during the summer tour of the US) made his debut. One of the goals we conceded was a smart finish by Davide Cais; on loan from Juve. Mavididi looked sharp throughout and scored after a lovely turn with Olivieri also taking his chance well. Not the worst performance against a side on a high after gaining promotion from Serie D last term. Juve U23 beat fellow Serie C side Imolese Calcio 1919 3-1 in a behind closed door friendly at Vinovo. English striker, Mavididi grabbed a hatrick. Juve B will play Alessandria in the Serie C league opener on Wed 19th September, followed by a trip to Carrarese, then home to Cuneo. The first fixture seems a stern test of our early credentials with Alessandria one of the sides in the play-offs of Serie C last term. Who are managed by former Udinese regista, who was often a joy to watch, anchoring the midfield, dictating the play, sweet left foot and dangerous from free kicks. Just what we are missing in the senior side!